The latest improvements to Ideate Explorer are added to our 2016, 2017, 2018 and 2019 versions. See below for a summary of some of the new features, or check out our YouTube What's New playlist. Ideate Explorer was significantly enhanced in May 2018 to include Warnings data. 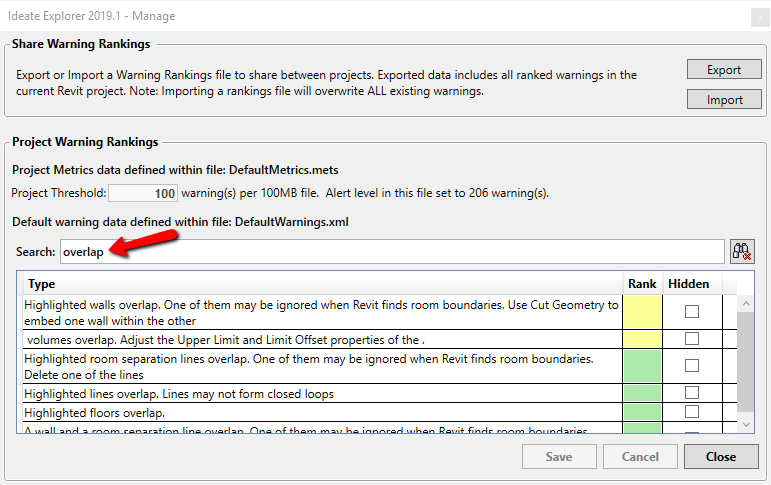 Learn how to Explore Revit Warnings with Ideate Explorer. 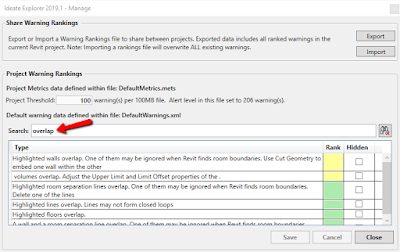 Per customer feedback, this version has a new option that forestalls the gathering of the warnings data to improve performance for large project files. When this option is selected, the warnings data is only gathered if/when the Warnings tab is active. This new option can be accessed through the Settings dialog, as shown below. 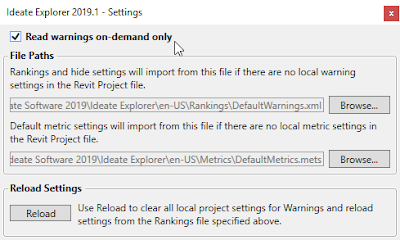 Based on customer feedback, this version includes the option to set an alert on the main page of Ideate Explorer when a certain threshold is exceeded. Set the threshold value from the Settings>Manage option. From the Settings menu, you can now access the Mange option to edit the Warning Rankings data as shown below. You can search for specific warnings and multi-select to edit multiple warnings at once. Use the Export button to save this data for re-use in other projects. This release contains changes to our standalone and trial activation processes to comply with the Global Data Protection Regulation (GDPR). Our network licensing has always existed behind your firewall and has therefore always met this criteria. Ideate Explorer is brought to you by Ideate Software. Annual subscription rates are as follows.